Grace and her family go to Belfast to board a ship to Canada. Grace’s mother sees three crows sitting on the mast of the ship, and tells Grace it signals a death. “My foot will never touch land again,” she tells Grace. Grace’s family is all seasick; Grace describes the ship to Dr. Jordan as “a sort of slum in motion.” Grace befriends a kind, elderly Catholic woman named Mrs. Phelan, who is sleeping in a neighboring bunk. As the ship enters an ice field, Grace’s mother falls seriously ill with stomach pain, which the doctor says is likely a tumor or burst appendix. Grace tries to stay awake and keep watch over her mother, but when she awakens in the morning her mother is dead. Grace’s mother’s death in the squalid conditions of the ship further underscores the way that social class defines a person’s life—and even her death. The ship doctor’s careless attitude is yet another example of the medical field’s abdication of responsibility toward poor folks, particularly women. This passage is also important because Grace’s mother’s death will ultimately be paralleled by Mary Whitney’s, with Grace sleeping through both deaths and internalizing an intense amount of guilt over the losses of the two most important women in her life. Grace’s heartbreaking narration of her childish logic about her mother’s burial reflects the cultural power of a society that devalues women. As a young child, Grace has already inherited her mother’s views of herself as a person of “second best” importance. Though Grace will develop her own ideas about her status as a woman and a servant, the fact that, as a child, her example of motherhood and marriage was so negative may help to explain why Grace is so averse to the idea of taking a male lover. This passage also subtly marks one of the first instances of Grace’s notions of the afterlife; her worry about not knowing where her mother is after her sea burial implicitly encompasses the question of where her mother’s soul has gone after death. This moment is important because Grace’s conviction that a window must be opened after a death—a notion she imbibes from her Catholic friend, Mrs. Phelan—will haunt her for the rest of her life. This speaks to the power of memory and the alluring comfort of superstition. Grace was not raised Catholic—in fact, she harbors some anti-Catholic prejudice—yet Mrs. Phelan’s notion becomes an integral part of her belief system. This is likely due to the fact that Grace was young and bereaved, and clung to this idea for comfort—yet, the idea proves more torturous than comforting over the course of Grace’s life. This passage thus wrestles with the complex question of why people believe what they believe. Grimm, Alexandra. "Alias Grace Chapter 14." LitCharts. LitCharts LLC, 7 Feb 2018. Web. 19 Apr 2019. Grimm, Alexandra. "Alias Grace Chapter 14." LitCharts LLC, February 7, 2018. 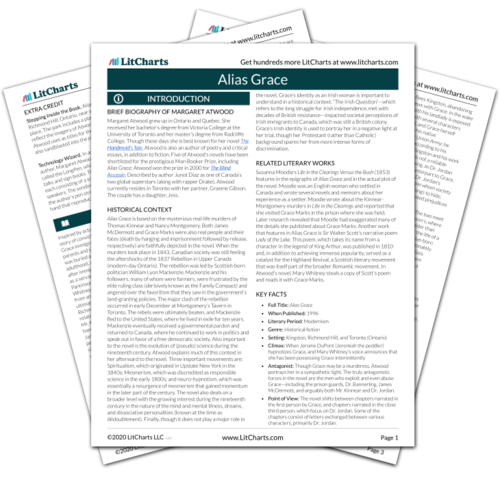 Retrieved April 19, 2019. https://www.litcharts.com/lit/alias-grace/chapter-14.